The Jason brand has been in the Australian market for almost 70 years. Celebrating our 70th Anniversary in 2018. Well known family bedding brand, a family favourite – Australian Wool Quilts. Founded in 1948, Jason is a well-known family bedding brand that has built a reputation of providing quality, and value for money products. Families trust Jason bedding products for our standards in quality and value. Jason is proudly Australian owned, many of our products made locally here in Australia in our renewable energy manufacturing facility. We pride ourselves on our wide range of quality family bedding including pillows, quilts, mattress protectors and toppers. The Jason brand is also home to a well-respected electrical goods range, including electric blankets and heated throws that have a reputation for excellent quality. Jason bedding is found at leading retail outlets across Australia. Jason has been a well-known brand in bedding since it’s beginning in 1948. Originally owned by The High Title Group it was acquisitioned by Sleepmaster in 2002. At the time well known Australian brand was well recognised by Australian consumers, but up until 2002 had not been well marketed and so had not grown successfully in the marketplace. A new era in bedding had begun, with Jason being a brand that was able to supply all bedding products including, quilts, pillows, blankets and underblankets. A stream of advertising and sponsorship built the brand into the well-recognised brand that it is today. 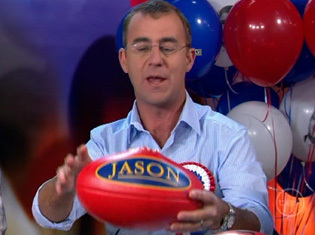 Sponsorship and advertising with numerous sporting teams and regular spots on Before The Game made Jason a household name. However, by 2013 Sleepmaster was in demise and entered receivership. A regular spot on Before the game made Jason a household name. At this stage Australian owned William A McNeil & Co saw the opportunity to own one of Australia’s most known bedding brands and proudly took ownership with a vision of growing the brand over the next few years. William A McNeil & Co has been working to build upon the reputation of the brand for the past four years, incorporating goods previously known to Sleepmaster and developing a new range of bedding and electric blankets to suit the market today. After working through the acquisition of Jason initially, William A McNeil & Co has built a brand to be proud of. With an extensive range of bedding and a sought-after range of trusted electric blankets, Jason has become one of Australia’s largest suppliers of quality electric blankets. Consistently working on new products, worldwide product research and cutting-edge technology, we look forward to the years to come as one of Australia’s biggest bedding brands. Celebrating 70 years as one of Australians most well-known bedding brands. Find out more about William A McNeil & Co Pty Ltd.
An Australian owned family business, William A McNeil & Co is a trusted name within the textile industry with over 40 years of experience. Being a textile company for over 40 years made it an easy choice to move into bedding and electric blankets. Fast becoming one of Australia’s most trusted electric blanket suppliers with zero product recalls. William A McNeil & Co is proud of the Jason brand and the history it has of being recognised for quality and value by Australian families since 1948. Visit the Jason website to view the vast range of bedding available.